Comments: It fits perfectly. Did not test on the route because the car was a total restoration. Comments: The garage I took them to charged me 250.00 CA. to install them. Once I got my 89 MR2 SC back, I got 4 new Michelin Pilots and a wheel alignment and the car has never handled better. Nice and tight. Watch out Lewis Hamilton. Comments: Hi its been too cold up here in Canada to install the recently purchased Prothane bushing kit on my car yet, but I will be doing it as soon as it warms up. 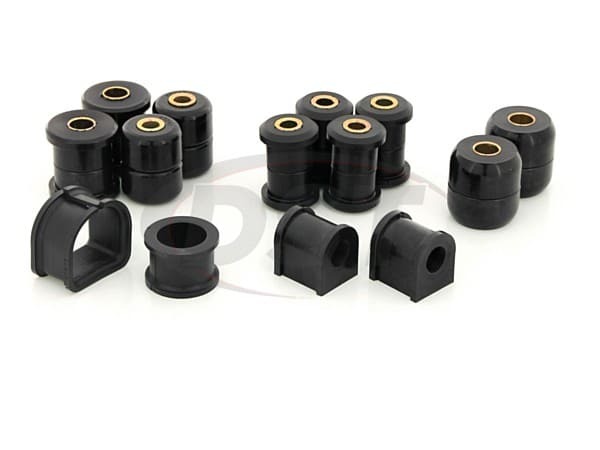 I have previously used full Prothane bushing kits on my 89 MR2 S/C and also currently have them on my 400HP MR2 turbo. They are an excellent product and offer a very noticeable improvement in feel & ride compliance over any perished and dried out OEM rubber bushings, which often have seized to the inside metal sleeves. I found them to be firm but not harsh at all and offer improved handling. Comments: Quality seems to be very good and instructions clear. The bushings fit very well and installation was painless. The hardest part of the job for us was removing the suspension components from this rust belt car. Comments: this kit really tightened up my mr2. this is the best bang for the buck upgrade anyone could do. Comments: Quality parts, great fitment. Obvious great upgrade from oem. Comments: Well if you need them replaced or upgraded this is the way to go. My mr2 rides great now.